News: Community Garden Set to Grow. PLOTTING: Hira Davies, Jacqui Ross and Nicole Te Wake are hoping for sunny weather on Saturday when the community garden is blessed. Fresh and tasty vegetables will be free to Riverpark residents once a new community garden is planted in Massey. The community is invited to a turning of the soil and blessing ceremony tomorrow at Woodside Reserve on Woodside Rd at 11.30am. 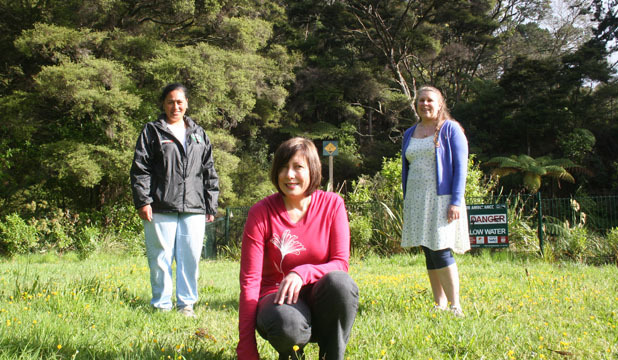 The Riverpark Action Group is establishing the community garden, thought to be one of the largest in west Auckland. Tomatoes, cauliflower, potatoes and cabbages are among the crops to be planted in the garden, that will measure 25 metres by 25 metres. Chairwoman Jacqui Ross says people who help are welcome to eat the produce. Garden co-ordinator Hira Davies suggested the idea for the garden to the action group. Riverpark group treasurer Nicole Te Wake says it has been a great catalyst for getting the community together. The garden has been made possible by the John Riddell and the Massey Community Board.